The preferred species is a spineless cactus, Opuntiaficus-indica, grown commercially for pads and fruit. Tortoises eat pads, flowers, and fruit. New plants can be started by planting pads. Preferably, use mature pads larger than your hand and at least 1/4″ to 1/2″ thick. The larger the pad the more energy is stored and the quicker it will produce new pads for feeding. Fresh pads sold in grocery stores can be used as tortoise food but would take a long time to produce more pads from them. Harvesting for planting. Cut mature pads (really stems) from the plants at the joints using a very sharp knife. Set the pads in a shaded place for a few days to allow the cut end of the pad to form a callous. If you transplant immediately after cutting, the pad may rot. Mature pads are not for feeding. They contain harmful concentrations of oxalic acid. Although this species has no spines, it does have minute glochids (glah-kids) at each of the small areoles (air-ee-oles) that cover the pad more or less regularly. Glochids penetrate the human skin easily and are troublesome to remove. To avoid this, use rubber-covered, rather than a fabric or leather gloves when handling. Bluettes brand, used for household chores is lined with fabric and is excellent. The glochids rarely penetrate the rubber. Planting. If possible, plant the cactus where the tortoise cannot reach the pads. As pads mature, they concentrate oxalic acid which makes calcium unavailable to the body. Tortoises need calcium to build bones and shell so feed only the small pads that bud from the starter pads. In the wild tortoises purposefully select the new growth. Prepare a well-drained area, a mound of soil over a bed of rocks if necessary. You may wish to start them in a 5 or 10 gallon container but within a season, transplant. Plant the pad just deeply enough for the soil to support it. The pad will root from each of the areoles. Plant in full sun and water several times a week during spring, summer and fall. Cacti have many superficial roots that pick up water near the surface. Deep watering is not necessary. The cactus will live on less water but you want to promote the production of new pads. A tortoise will eat several each day. Offer pads to your tortoises daily while the pads are still apple-green and no bigger than the palm of your hand. To remove them from the plant, bend the joint at the base of the pad and they will snap off cleanly without the need for you to cut them. Choose at least one place to offer the pads consistently, a place that is shady, at least in the afternoon. A covered patio may be ideal. The tortoise will remember where to come to eat the pads. Place the narrow end of the pad under a heavy brick that will hold the pad firmly on the pavement or ground as the tortoise eats from it. 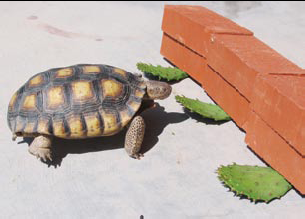 If the pad does not rest far enough off the surface for the tortoise to get his mouth on both the top and bottom of the pad, push a very small pebble under the pad as far as you can toward the brick to hold the pad up just far enough. Replace uneaten pads with fresh ones, each day. Please refer to the photo below. Tortoise can easily eat these cactus pads. The heavy bricks make is possible for him to bite and pull, as if the pad were attached to the plant. A small pebble props up each pad. Flowers and Fruit. Wear your gloves when harvesting flowers and fruit, too. Sweet fruit is not a major part of the wild tortoise diet and sugar makes conditions in the intestines good for parasites; however, there should be no problem from the seasonal harvest of a few prickly pears which are a natural part of the diet and not very sweet. Some tortoises prefer pads to fruit and flowers. More of the energy for growth will go to producing pads if you remove the flower buds, save some for the bees. You will soon learn to recognize the difference between flower buds and stem buds. Flowers and fruit can be offered on the grass. Hardiness. Even in the southwest every few years, winter temperatures are low enough to freeze the plants; however, usually the lower pads remain undamaged. When the possibility of frost is over and before growth starts in the spring, remove the damaged pads. Prune to shape at any time, cutting at the joints between the pads.